A train of the Batangas Railways. Image source: Posted by user Pinai on the Indonesia v the Philippines discussion board on www.city-data.com. “There is but one steam railroad of any consequence in the Philippine Islands. It connects the city of Manila with Dagupan, on the Gulf of Lingayen. It is owned by an English corporation named the Manila Railway Company, Limited.” This company obtained the rights to build and operate the railway from the Spanish colonial government in 1885. Also existing in 1902 was a railway for steam-powered trams2 which ran from Manila to Malabon via Caloocan. This was the first railway system built in the Philippines3. It was operated by a company owned by a Señor Don Jacobo Zobel de Zangronis, who had obtained the concession from the Spanish colonial government in 1884. The Manila-Dagupan train. Image source: John Tewell on Flickr. In Mindanao during the Spanish colonial era, construction of a military railroad planned to run from Iligan to Lake Lanao had already been started, but the tracks had since been torn up by locals. 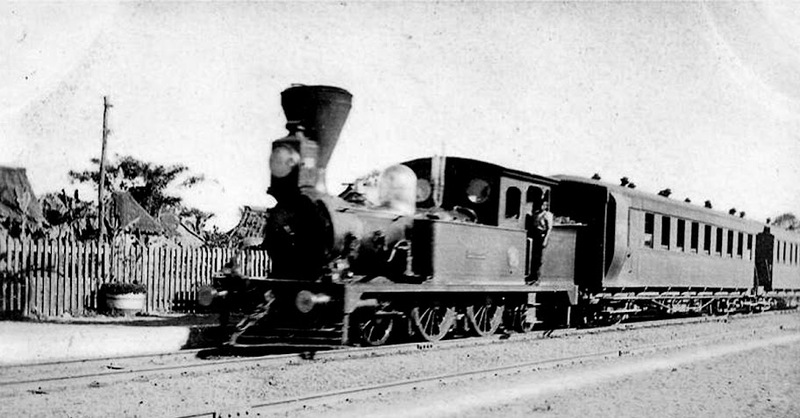 There were also short railway lines in the island of Cebu which connected the mines to the ports. Other than these, there were no other significant railroad tracks or train services in the country, or at least as far as Root was aware. The railway system which the American colonial government envisioned included the construction of lines in Luzon as well as the islands of Panay, Negros, Cebu, Leyte and Samar. The proposed railroad network for Luzon included the laying down of tracks and the operation of train service to Batangas. The former Spanish government official and historian Manuel Sastron must have been privy to this instruction because in his 1895 book “Batangas y Su Provincia4,” he made mention of the impending construction of this very line. 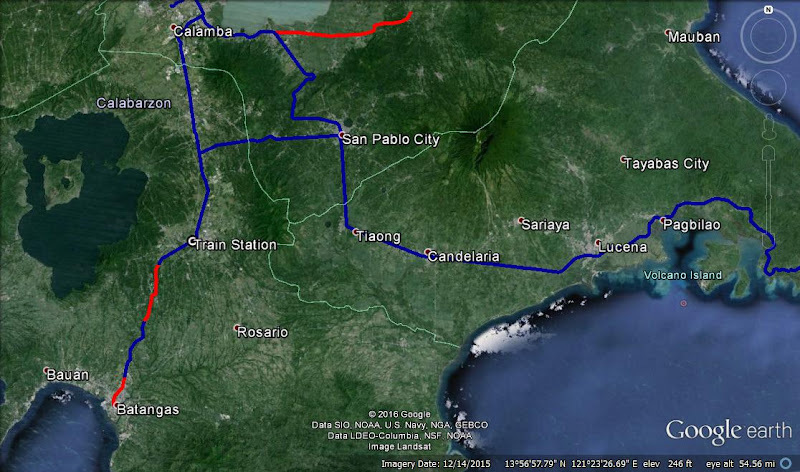 From Calamba, the line would go south to the town of Batangas before curving north to Taal, presumably through Bauan. Sastron wrote this in the chapter devoted to the town of Cuenca, saying that were this line to be completed, the town could become a “place of recreation” for the wealthy people in Manila who could then avail of its “peaceful and healthy life.” As we now know, the line was never built during the Spanish era. On 14 December 1905, the New York-based Speyer and Company submitted a proposal which included, among others “a line from Manila to Batangas and Bauan, with the right to operate… from Santo Tomas to Lucena…” I am as yet unable to confirm that it was, indeed, this company which built the railroad system in Batangas. The Batangas rail network during the American era. KML file from PNR, plotted on Google Earth. According to the web site Laguna Railways, the Calamba to Bauan via Batangas line was eventually built with a junction in Malvar. From this town, the line branched out en route to Alaminos in Laguna5. By 1917, the American colonial government would nationalize the railway system in the country and take over the operation of its lines, including the one that led to Batangas and Bauan. 1 Along with other important details of this article, taken from “Transportation in the Territory of Hawaii,” by L. E. Pinkham, published 1907 in Honolulu. 2 Trams are typically lighter and shorter than conventional long-haul trains. “Tram,” Wikipedia. 3 “The Railways in Philippine History,” by Augusto V. de Viana, PhD, published 2008, online at Laguna Railways. 4 “Pequeños Estudios, Batangas y Su Provincia,” by Manuel Sastron, published 1895. 5 “Google Earth Philippine Railroad Triangle Collection,” online at Laguna Railways.